We associate some holidays with certain risks -- fireworks on the 4th of July, heavy traffic on Memorial Day, and so forth. 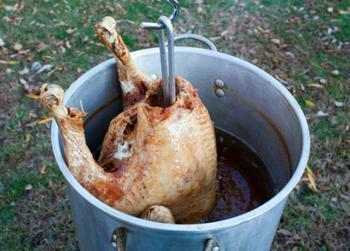 And now Thanksgiving has its very own hazard -- cooking fires caused by turkey fryers. Year-round, cooking fires are the most common cause of house fires and Thanksgiving sees more such fires than any other day of the year, thanks to the growing popularity of turkey fryers. Stop! Don't wash your turkey! Thanksgiving troubles -- who needs them?